Bugbane also commonly referred to as black cohosh is one of a number of flowering plants belonging to the Ranunculaceae which includes the buttercup. Also known as Black snakeroot, Rattletop and Richweed, this plant offers a wide variety of medicinal benefits ranging from pain relief and easing menstrual symptoms to supporting a good night of sleep. Known scientifically as Actaea racemosa or Cimcifuga Racemosa, the plant is native to the woodlands of North America. The roots and the rhizomes of the plant are used for therapeutic purposes. Bugbane is a native of North America where it thrives in the wild especially in woodland areas. This flowering plant has a very long and distinguished history of therapeutic use. During the 19th century, bugbane was commonly used by the Native Americans as a traditional remedy for pain and arthritis. It was the Native Americans who first introduced the plant to the early European colonists. Later, the herb was introduced to Europe itself and during the 1950s, it developed a reputation for treating women’s health issues. It is still used to remedy many of the symptoms of menopause like night sweats, vaginal dryness and hot flashes. It is also commonly used to treat menstrual irregularities and premenstrual syndrome. The underground stems and the roots of the plant are used either fresh or dried to make solid extract, capsules, tea infusions and liquid extract. In Germany, the use of bugbane has been officially authorized for relieving menopausal symptoms, menstrual pain and premenstrual discomfort. Today bugbane is still widely used in supplementary form to relieve a host of conditions many of which are common female problems caused by menopause or the menstrual cycle. However, its benefits are not limited to women’s issues and the following list of benefits represents the most common and effective uses. According to research, bugbane has excellent anti-inflammatory properties which give it a very wide range of health applications. Inflammation is at the very heart of many serious illnesses including heart disease, digestive illnesses and even cancer. Bugbane has long been used by native Americans and later by women across Europe to relieve many of the familiar symptoms of menopause. According to research, there is good reason to trust this traditional remedy. Women have also traditionally made use of bugbane to help relieve the pain experienced during their menstrual cycle. In Germany, bugbane is sometimes prescribed as a natural pain remedy instead of more powerful pain killers. As well as menstrual pain, women have long used the herb to ease the pain of childbirth and there is some evidence that bugbane can also help speed up contractions during labor and hasten the birth. Note : You should never use an herbal remedy if you are pregnant without getting the go ahead from your doctor. 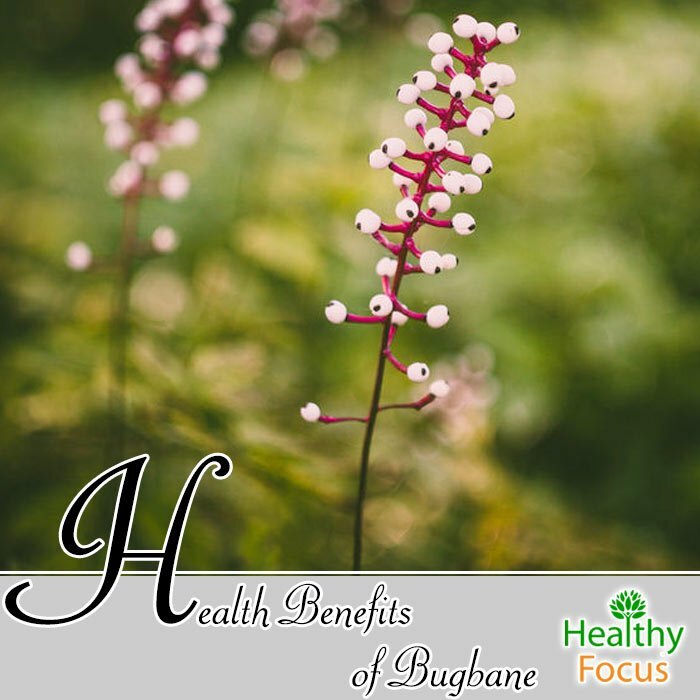 According to research, bugbane may also help improve your digestive health by helping to eradicate waste from your body. It may have some applications for treating constipation, bloating, cramping and flatulence. One of the main traditional uses of bugbane was to relieve feelings of anxiety and stress. As is the case with many herbal remedies, science is beginning to reveal just how much our ancestors knew about the healing properties of various plants. Up to now, there have not been any trials into the effects of bugbane on anxiety in humans but the animal trials supporting its traditional use have been promising. Many people suffer with sleep troubles which can bleed over into their daily lives causing both mental and physical issues. While anybody can suffer from sleep related disorders, insomnia is especially common in women going through the menopause. There are many advantages to using an herbal remedy for your sleeping troubles compared with powerful commercial medications. Pharmaceutical sleeping pills are far more likely to cause unwanted side effects and dependency. There is no guarantee that the results will be replicated in humans but the study was nonetheless very promising. Bugbane supplements are available in several forms but are usually taken in pill or capsule form. Bugbane is also available in the form of liquid tinctures or dried to make a tea infusion. There is no official fixed recommended dose of bugbane and you should be sure to read the dosing instructions on the label. Many experts recommend taking 80mg once or twice a day for symptoms related to menstruation and menopause. Remifemin which is the most popular brand preparation on the market contains a 20 mg dose in each tablet. So long as you follow the dosing instructions, bugbane is generally considered safe. However, there have been reports of certain mild and more severe side effects. Potential side effects include headaches, nausea, diarrhea, stomach upset, constipation and vomiting. There are also reports of users having weight issues and lower blood pressure. Be sure to buy your bugbane from a reputable company because many of the side effects reported may have been caused by misidentification of the plant. The one side effect that has been linked consistently to bugbane is its negative effects on a person’s liver. The damage to the liver could be caused by using bugbane in conjunction with other supplements and medications. It is important that you speak to a doctor if you are on any other medications. You should not take bugbane supplements for more than a few months at a time. Pregnant women and nursing moms should avoid using bugbane owing to the lack of safety data. Have you ever used bugbane to treat menopausal symptoms or any other reason? Please let us know what you thought. We would be very happy to hear from you.